The Winco PUT-9W Polycarbonate Utility Tong, White 9" is a practical and economical serving utensil that can be used to serve many items on the salad or food bar. 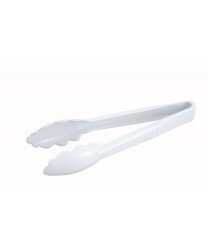 With its sturdy polycarbonate construction, scalloped edge design and excellent grip, you can place these tongs in salad crocks, serving bowls and on food platters. You can also purchase different colored Winco polycarbonate tongs and designate different uses for each color in order to prevent cross-contamination and meet HACCP standards. Winco FN-24 Stainless Steel French Whip, 24"
Winco BHKP-21 Extra Heavy Stainless Steel Perforated Basting Spoon, 21"
Winco AFP-14A-H Gladiator Aluminum Fry Pan with Red Silicone Sleeve 14"